ALC600G - G & W Machinery Sales, Inc. The ALC400G, Rigid Linear Motor Driven CE Certified Wire EDM Machine is one of the newest additions to the Sodick product line-up. This new machine includes some exciting new features, such as; a full security enclosure, next-generation SPW control with Smart Pulse Generator, and other performance boosting technologies. The ALC series wire EDM offers the most advanced safety features on the market, in full compliance with international CE specifications. In cutting precision fitting parts with a 3.94" (100 mm) thickness, Sodick has achieved the following; improved cutting speed, reduced cutting frequency, improved part accuracy and improved surface quality. A 32% cutting time reduction has been achieved using the ALC600G. 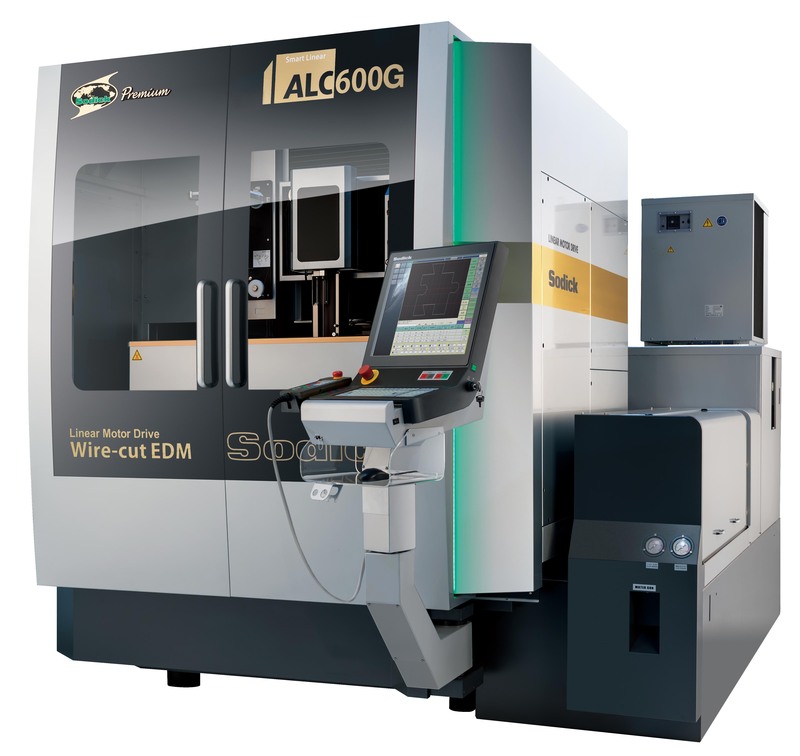 Sodick’s ALC600G rigid linear motor driven, high precision Wire EDM machine features new user-friendly EDM technology which further enhances productivity and EDM precision. The machine’s rigid linear motor axes drives are coupled with glass scales on the X, Y, U and V axes which ensure precision cutting and positioning accuracy. Sodick’s X, Y, U and V linear motor drives have no backlash and are backed by Sodick’s 10-Year Positioning Accuracy Guarantee. Sodick currently manufactures and delivers only linear motor driven machines; proving the unrivaled reliability of Sodick's own rigid linear motor technology. Sodick's rigid linear motors have the optimum flat design. The machine castings support the linear motor to achieve ideal linear performance, the ultimate design for precision machining. The new Sodick Control SPW (Smart Pulse Wire) has many attractive features, from the use of the industry standard Windows 7 operating system, to an enhanced, 19 inch horizontal TFT multi-touch screen. The ALC control design streamlines the former tablet and classic control modes into a single work screen with easy-access functions. The streamlined design also improves control processing speed, for a highly responsive user experience. The new SPW control also incorporates a fully fiber optic cabling for instantaneous data communication, greatly improving responsiveness. The NC programs are supported with 2D and 3D graphics. Maintenance screens show the status of the machine and remote access is possible for maintenance and supervision. The Smart Pulse Generator reduces the number of cuts necessary to achieve the required accuracy and surface finish. This reduction in time translates directly into a financial advantage. Intelligent Q³vic EDW technology allows the importation of 3D CAD files and is standard with the ALC Series. This automatic programming system detects the profile of a workpiece that can be machined with Wire EDM and extracts the machining contour. Significant savings in programming hours are possible thanks to this advanced software. The Sodick Motion Controller (K-SMC), accurately controls the high-speed and precise linear motor drive movements through commands from the NC unit. The K-SMC was heavily researched and developed to bring about new technical innovations to electrical discharge machining. Developed in Silicon Valley, CA, the K-SMC accurately controls high-speeds, rapid acceleration and precise positioning. The ALC Series features energy-saving designs and technologies. Compared to conventional EDMs, the Sodick Wire EDM Machine Range can reduce average energy consumption by up to 60%. This AWT system allows submerged and non-submerged threading. Combining thermal wire cut for a straighter wire and new water-jet function, the reliability of the Sodick AWT system has been further improved. The exclusive use of closed guides on the ALC600G in combination with the FJ AWT further increases productivity. The 3-sided rise/fall worktank ensures a large set-up space and ergonomic accessibility. Since 3 sides slide down, the machine requires less operating space. The no-drip feature insures a clean shop floor, maintaining a safe work environment. The fluid level is automatically adjusted according to the workpiece thickness and the operator can easily check machining progress even on thin workpieces because the slide tank can be stopped in intermediate positions while machining. The interior of the tank is made from stainless steel for quick maintenance (unpainted).